Contemporary plaster cornices created for a client in the Preston areaWilliam Wilson Architectural Mouldings Ltd are specialists in the restoration, production and installation of decorative plaster mouldings. Based in Fleetwood on the Fylde Coast, we operate throughout Lancashire, Cumbria and the wider North West. We also stock a range of in-house produced plaster Centrepieces, Corbels, Cornices, Panel Mouldings and more. With over 20 years experience with ornamental plasterwork, we work on anything from replacement plaster coving for a Victorian terraced house to major restoration work on Grade 1 listed buildings. 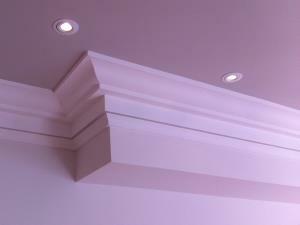 For examples of our plaster mouldings work, please take a look at the Photo Gallery page.